This is a dystopia book like the Hunger Games. It also comes in three. Like they all do. It is also described as a young adult book – apparently I haven’t left that age yet. It disturbs me that it’s called children’s books just because of the young age of the main characters and the fantasy in it. Like it disturbs me that having a great fantasy about all things in life and seeing things in a “childish manner” is considered less worth. For me it’s more about creativity than anything else, to be open and let your mind go in crazy paths. That’s a good thing! Divergent is the first, Insurgent is the second and the author Veronica Roth is writing the third right now – expecting it to come out fall 2013. So I’m only half way down the first one but I love it. After Hunger Games I read another dystopia trilogy called Matched (second book Crossed) but it dosen’t have that edge that Hunger games has so I kind of quit in the middle of the second book. Anyways this one has it all, the thrill, the love, the weird world, the hope and kind of revolutionary spirit. As always I will link to a proper review from the NY Times. Gotta get back to reading now! 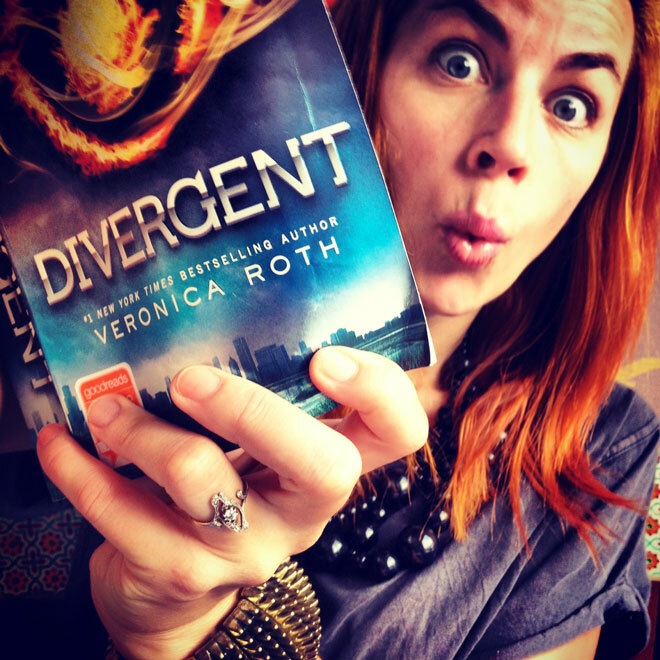 Ok – now I read both Divergent and insurgent I must say I love them both – better than the Hunger games! I so don’t want to go out in the real world. And I’m really looking forward to the next book (another year oh now). Haha Gigi – cool than we are more old young adults! Will mos def look into the maze runner! I also liked Divergent better than Hunger Games! I loved it so much, I immediately read it again after I was finished! Here’s the thing: Gale & Peeta — Not Hot. Four? HOT. I loved him! Great male lead! Melissa – i totally agree. Four is so hot. I hope the y will cast him well in the movies. Even tough I feel a bit cougarish saying that. It’s easier to read a young adult book…. I started reading the book because I need it to slow my brain. I am in law school and work part time at law firm and the reality of it all was taking its toll. I LOVED the hunger games and when I saw your post proceeded to download it to my kindle. I started reading it on thursday and My kindle says it’s 98 percent done. Sue- great to hear you like it!! The cougar thing is a joke. I mean Tobias just seems like a great guy. Good and kind. Great for all ages to like! Search for Free four- it’s a chapter written out of Tobias point of view. Isabelle: oh I can’t wait for the next book. So long- another year! Oh havnt seen it yet! Shame on me!! Looking forward to it!